Thank you everyone for you kind comments, and love and hugs. I really appreciate them all. 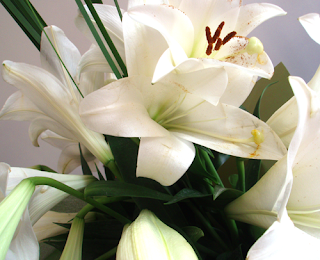 Taph and HappySpider sent - very appropriately, white lilies. Thank you ladies, they are so beautiful, and it was a very touching surprise. 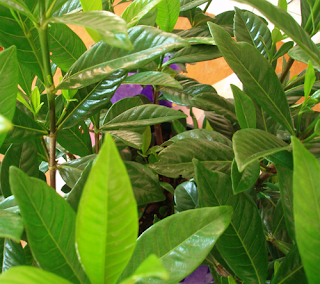 And we were completely bowled over when this Gardenia bush arrived from Lily's veterinary hospital! She had many friends, that little dog. Here is Lily's grave, with the bush rose on top. 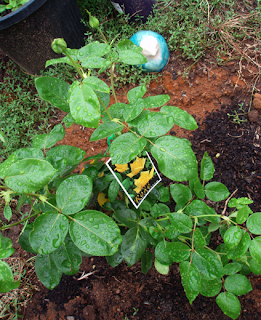 It's about to bloom, so hopefully I will have some yellow roses to show you soon. The blue & white bird on watch over Lily is one I made in ceramics class some years ago. We're missing her in funny ways - like how we have to clean up food that falls onto the floor now - our furry vacuum cleaner is no longer there! 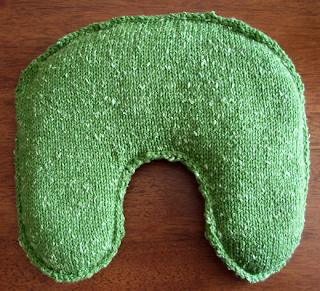 I've just about finished the neck pillow for my Uncle Tony - it just needs 3 buttons. On the suggestion of the man at Stockfeed, I used millet (I wouldn't be able to import buckwheat hulls into Australia because of Quarantine restrictions). They are very smooth, but it does make the pillow fairly heavy. I hope this won't be a problem! I fly to Melbourne on Saturday, with my dad and his wife, to see Uncle Tony. He has a very rare form of acute leukemia. It's a huge blow. As we're only taking hand-luggage, and I want to knit at the hospital, I'm breaking out my trusty pencil needles again. I figure if I separate them (one in a handbag, the other in a tote bag) they won't cause comment. I don't intend to knit on the plane this time. This is another Short Circuit Scarf, in Noro Silk Garden. 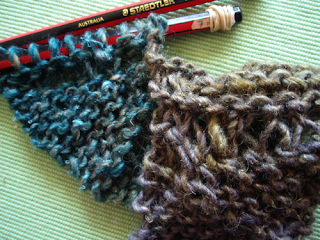 It'll be fairly short as I've only got 2 balls of the Noro. 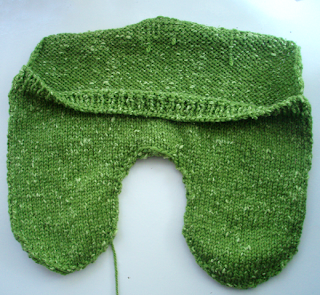 I've figured out to knit backwards for the really short rows, which is kinda fun. As you know, life has been one awful thing happening after another, for quite some time now, since Dotter got Type 1 Diabetes in June last year. Life-threatening illness, deaths, even more life-threatening illness... all the serious stuff. Pretty grim. I've been very depressed, not surprisingly, and have really not been coping well in recent weeks. Last night Dotter and I went to our first belly dancing class (with fellow Raveler Souhair as our teacher!). We were both feeling exhausted and depressed, and not sure what to expect, but willing to give anything a try. Well. We know how to shimmy. It's so cool. We're hooked. Hey that's fantastic about the bellydancing. Take those endorphins and run with them! Lovely flowers and plants for lovely Lily (so good of the vet hospital!). So glad the belly dancing helped. Hope your journey is safe - I'm sure your uncle will adore his pillow, which is lovely. hooray for shimmying and wobbly bits!!! Sounds like just what you needed!!!! Will email you tonight with some Melbourne suggestions! What lovely Vets you have, and friends too. Belly dancing is very popular here: they have lots of Adult Ed classes!!! Beautiful flowers all round and yay you for finding ways around the stupid airline rules. Oh YAY for you both. Well done and very sensible. If you're ever feeling depressed about life or you've been thrown one too many curve balls, something like belly dancing is absolutely the best thing for you. If airlines are being daft, how about express posting something to knit there? It could meet you on arrivel. Just a thought. Hurrah for our wobbly bits and how best to take advantage of them. I hope that you and Dotter have wild and crazy fun with the class. Safe trip and happy knitting. It's amazing how moving your body helps keep your brain from spiralling around your troubles. Many happy shimmy-ings of wobbly bits! Oh Yay for bellydancing! Undulate your blues away! Lovely floral tributes. How thoughtful. 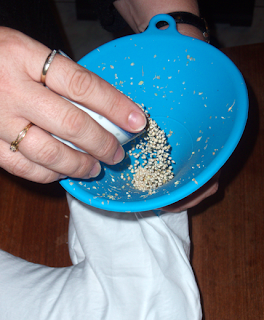 If you can warm the millet in the microwave, it might be a terrifically soothing sort of pressure. What a loving gift, and what a dear woman you are! Invest in a jingly belt for those bellydance sessions. It makes the shimmies accoustic. I had a tape of a belly dancing exercise routine. It WAS fun. It makes you move muscles you don't know you have. I lent it to one of the girls' gym teachers and she lost it. I was quite put out because she didn't offer to replace it. Good idea to use the millet. My daughter has one of those pillows and loves it. She says it's the best one ever. My bellydance teacher is on hiatus due to family illness and the intransigence of Centrelink - I am soooooooooo missing it. Good on ya and Dotter.